There is a no denying the fact that understanding your buyers helps you to sell more. The more you know about them and their needs, the easier it is to identify opportunities to sell and resell. A B2B typical setup is defined by fewer accounts, big deal sizes, and longer sales cycles. There are multiple stakeholders involved in the buying decision, which makes the whole process very complex. To deal with this complexity, Account Based Marketing (ABM) has gone beyond a buzzword and has been termed as the next big thing in the marketing space. The basic spirit of ABM has been always present, just that it never had a name before. All the customized content and programs in the world won’t deliver pipeline if you’re focusing on the wrong account. A successful ABM strategy starts with identifying the right account and understanding the needs of key stakeholders, involved in the buying process. Marketers never had the ability to zero in at the level of precision they are capable of today. The level of ABM implemented in your organization will completely depend on the nature of your market. In the next section, we will explore steps to compile your target list and what you should consider while shortlisting them. Create an Ideal Buyer Profile: Create profiles of the companies based on relevant attributes and shortlist those which defines the ideal fit for your target list. 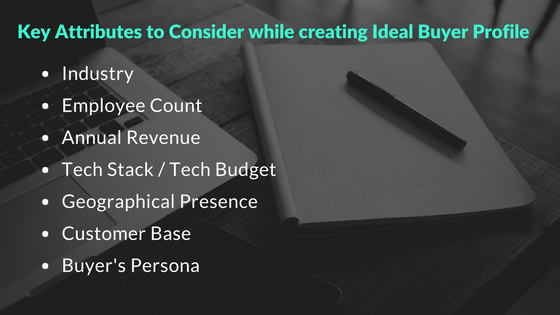 These attributes will vary based on what’s most important to your business. These profiles will help you to deliver content and relevant experiences that are tailored to the needs of that particular account. Interact more with the Sales Team: Since they directly deal with different accounts, the sales team has insight into which account can be efficiently targeted. Both sales and marketing teams can work together to agree which high-value accounts you need to prioritize. This targeted list can help your team to skip the tedious job of grinding through marketing qualified leads (MQLs) and instead focus on delivering your products or services that improve your success rates. Review Your CRM: Look deep into your CRM to discover all the highest value companies. Based on the commonalities create a profile of a company likely to generate large deals. You can also build a list of names like those you already sold to, CRM can also help you to know whether accounts fitting the profile have engaged with your brand by visiting your website or by downloading content. Such companies are more receptive to your marketing and can give much quicker results once you target them. Predictive Modeling: Predictive selection allows for the discovery of similar accounts which fits into the required profile, by using highly advanced predictive analytics tools. It considers all the available data from internal and external sources. With data like tech stack, social media activities, blogs, etc. predictive modeling can help you to shortlist the companies with the highest propensity to purchase the products and services you offer.